In January, I am giving a talk at Tate Britain as part of a symposium on the theme of apocalypse, which will be in conjunction with the John Martin exhibition currently on there. The talk will focus on depictions of London, on the apocalyptic city and it will draw on the research on the "sublime" which I've developed over the last few years. It thus feels part of a rather different body of work from the kung fu research that this blog deals with. However, with the conference only just lined up, I stumbled across a Chang Cheh film the other day that I had not seen before: Four Riders (1972). Oddly enough, it is a film which makes clear reference to the apocalypse, for indeed the riders of Chang's title are the Four Horsemen of the Book of Revelations. Given this synchronicity (and since I'm thinking about apocalypses in any case), I thought I might jot down a few notes on this film. The reference to the apocalypse occurs most clearly in one particular scene where one character, a hospitalised soldier reads the passage from the Bible in which the horsemen are described. As he reads, Chang envisions these riders cinematically as ancient Chinese warriors in generals' armour, riding in slow motion. The opening credits of the film (to which Chang returns in his final shots) also, however, make the reference. They show a desolate – but hauntingly beautiful, sublime even – snow-clad landscape, across which four tiny figures – hardly more than black spots on the screen – are making their way. Four figures make their way across the snow-covered landscape of Four Riders's opening sequence. Such apocalyptic images, however, are primarily allegorical. The apocalypse which Chang seems to be alluding to through the film is that of twentieth century history, with its seemingly perpetual unleashing of war, famine, death, and conquest. The film, made in the midst of the Vietnam War, is set at the moment of the ending of the most famous of the preceding explosions of Cold War tension into prolonged, violent conflict in the far East: the Korean hostilities of the 1950-53. As if to highlight the allegorical, rather than historical, nature of his depiction of post-armistice Korea, Chang makes little concession to period detail, with the interiors, costumes and haircuts seeming to locate the film much more squarely in Chang's own 1970s. With many of the outdoor scenes shot on location in Seoul, we have a bleak landscape of neon lights that speak more of a globalising order of capitalism than of the authentic look of the 1950s. This environment, too, it seems, is for Chang a part of the apocalypse of modernity. The film, in fact, in spite of its Korean setting and in spite of its heroes playing the role of soldiers, is a gangster film: a film not so much about war as about the corruption, moral decay and violence of the (post-)colonial city. The tale revolves around a group of demobbed Chinese heroes turning to the city in search of fun and relief from the tensions of war. One of the protagonists comments near the start – with a certain situational irony given the unfolding of events in the film – that any big city is a paradise for those who have money to spend. They find the city, instead, to be a hellish zone of conflict, violence, exploitation, danger and horror. The setting of the film in armistice-moment South Korea seems to function primarily to add a background of totalitarian control and military government to the urban setting so familiar from kung fu films. After the icy wastelands of the credits, the film opens with one of the four main protagonists, played by Ti Lung, at the moment of the end of the war and the end of his military service, in his army unit, tearing the rank insignia off his lapel and throwing them at the feet of his commanding officer: "Colonel," he says, "As of today I'm no longer in the army any more, and this means you're not my boss now!" He then assaults the shocked Colonel, and this results (for reasons not entirely explained) in a big punch up between the men of his unit, yelping in joy as they fight each other. Ti Lung extricates himself from the melée and when the MPs arrive, they ask him what the fight is about. He answers (lighting a cigarette): "I wouldn't know. But still, it's been a long war. They've got to fight somebody." As the MPs rush in to restrain the men, Ti Lung calmly steals and drives away in an army jeep, off to spend his severance pay (and anything he can get for the jeep) in the big city. "I wouldn't know. But still, it's been a long war. They've got to fight somebody." Ti Lung – suave and macho as ever – is confronted by an MP. The scene is significant in setting the tone for the film. It sets up something of the paradoxical politics which pervade the piece. We have in Ti Lung's character something of the archetypal hero of Chang's work of the early 70s: an anti-authoritarian rebel who, as with the xia of ancient Chinese martial tales, is more concerned with being true to himself than the structures of social hierarchy or order. In this regard, the character is a fine example which would bear out Chang's own discussion of his films (quoted in a recent post here) as aligned with the energies of the countercultural movements of the late 60s and early 70s. Authority in this film (as the Colonel in the first scene) is despised, seen as corrupt or at best draconian and incompetent. The military police, who arrive in numbers in this first scene are a constant presence throughout, and we are presented, as the opening scene already implies, with a bankrupt, paranoid order lapsed into the quasi-fascist police state that in fact literally held sway in South Korea for many years after the armistice. The heroes of the film – four Chinese mercenaries leaving the army and meeting up in the city after peace has broken out, played by Ti Lung, David Chiang, Chen Kuan-Tai and Wong Chung – serve as exemplars of an individualism and Romantic rebel integrity that Cheh poses as standing in its face. In the opening credits, as we move through the icy, windswept landscape, the camera lingers on one red flower poking up through the snow. The heroic and noble characters played by Ti, Chiang, Chen and Wong, then, are such flowers, in an apocalyptic modern landscape of authoritarian despotism, absurdly senseless war ("They've got to fight someone! "), and corrupt economic exploitation. 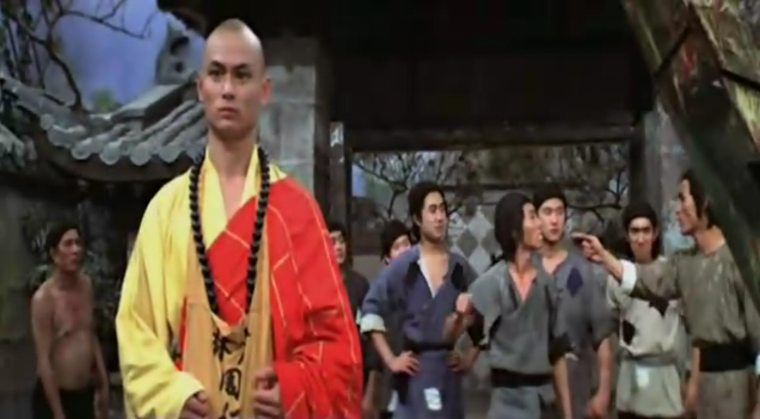 The heroes of Four Riders (Left to right, played by: Ti Lung, Chen Kuan-Tai, Wong Chung and David Chiang). Endangered flowers in a hostile landscape, or an elemental force of justice? The four are brought together in combatting a group of gangsters who are smuggling drugs out of the country in the uniforms of demobilised American servicemen, a group clearly involved in a series of criminally exploitative businesses, and operating out of an American-themed bar (the "Hello John Club"). Ti's character stumbles across and attempts to intervene in the gang's killing of a GI, and, beaten by the gang and left unconscious, is framed for the murder. The other three – Wang (who he has given a lift to the city), Chen (playing a melancholy soldier, recovering in hospital after being wounded in action), and Chiang (who has become an alcoholic drifter in the city's bars) – join forces to free Ti and (as one would expect from the genre) wreak their bloody revenge on the gang. The end of the film, a running battle that extends over a number of locations and ends in a gymnasium, stands out even within Chang Cheh's bloody oeuvre as an unrelenting and protracted slaughter, as the four heroes (slowly, of course, themselves being skewered or hacked to pieces in the process) work their way through the entire criminal gang. In this regard, they serve as one of the possible referents of the "four riders" of the title – as a cleaning scourge, if you like, of the evils and corruption of the modern world, a judgment passed on it. However, such a reading hardly seems to do justice to the grimness of Chang's apocalyptic vision in the film. As the remaining heroes, bloody and wounded themselves, finish off the gangsters, the Military Police arrive, surround the building and, believing the heroes to be a part of the gang, cut them down in a hail of bullets. It's an ending that echoes and outdoes that of George Roy Hill's Butch Cassidy and the Sundance Kid (a film which three years previous to Chang's film), but whereas the cowboys seem to go out in blaze of glory, in Chang's altogether more dystopian version the impression is of futility of heroism in the face of an all-powerful, deadly state machinery – one that in spite of its might is nonetheless irrational, absurd and incapable of (or just uninterested in) providing for human happiness or justice. The heroes, in spite of having secured the evidence of their innocence, are gunned down without the chance to present this. Rather than the cavalry rushing in to save the day at the last minute, this Military Police arrives at the end to finish off the massacre, leaving behind no shred of hope, only indiscriminate carnage. Control triumphs over justice: the scene is sewn up by the Military Police. Its pessimism, of course, hardly seems fertile for revolutionary endeavour (even if Gramsci contrasted a pessimism of the intellect with an optimism of the will). Furthermore the film's vision of fallen modernity all too easily feeds into conservative discourse, and perhaps makes a certain sense of the fact that Chang's films locate themselves in a fantasised past rather than a modern present, escaping into a zone where alternate moral values to those provided by money and power can be projected – values of heroism, brotherliness, the fight for justice and so on. Such a past (real or imaginary as it may be) nonetheless might well serve as a repository of "heterologies," asserting that the world has been and so potentially still might in the future be different from the way it is now. However, as Cheh's own understanding of his work of the late 1960s and early 1970s suggests (see my recent post), there is a certain degree to which this film might align itself with a counterculture, setting its values against a post-colonial state which is literally here the South Korea of the 1950s, but is clearly also more generally the Cold War order of 1970s Asia. I believe that we should not only recognise in this grim landscape the totalitarianism which a Hong Kong inhabitant might have feared in the PRC, but also – through the implication of the commercial landscape of Seoul and the globalised links of the criminal gang, with their connections to the US and with an American Boss – that of Hong Kong itself, still a non-democratic state that had, at the end of the 1960s, come down hard on its rebels, revolutionaries and dissidents. Perhaps for leftists, the political valence of the film might depend in large part on where one stands on questions of the counterculture of the late 1960s and early 1970s. Is this to be understood only as a retrenchment of capitalist values, with its insistence on individualism, hedonism and the like? Or are we to understand its pursuit of freedom and libertarianism as fundamental to any radical project, serving as a vital critique of the more repressive socialist regimes that grew up in the twentieth century as well as to the repressive nature of early-twentieth-century capitalism? An image of revolutionary hope? Spring after the freeze?